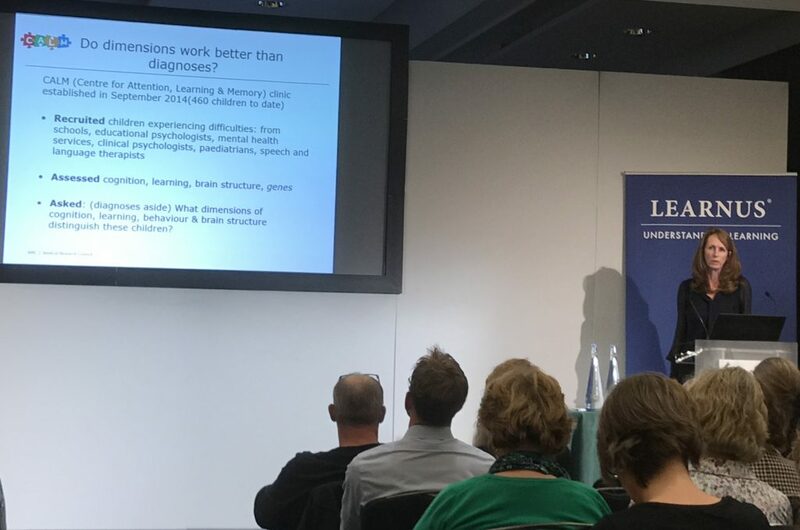 In the second Annual Learnus Public Lecture on educational neuroscience held at Church House in Westminster on 17th May 2017, Professor Sue Gathercole (MRC-CBU, University of Cambridge) talked about the challenges faced by families, practitioners and policy-makers in supporting children who are struggling to learn. She identified major hazards. These include social inequities, difficulties in identifying underlying problems in children whose first language is not English, haphazard routes to professional help, dependence on diagnoses that are of limited value, and an unrealistic emphasis on cure rather than compensation. Prof. Gathercole argued that diagnoses of specific disorders, such as dyslexia, dyspraxia, developmental language disorder, dyscalculia and ADHD, might provide re-assurance to parents and access to therapeutic resources. However, more often than not, children exhibit more than one ‘disorder’, symptoms can be highly variable for child assigned the same disorder, and separate diagnoses play down the similarities often shown between children with different disorders. Individual diagnoses therefore can hinder identification of underlying cause or most pragmatic treatment. She illustrated some of the challenges by describing recent research on struggling learners at the Centre for Attention, Learning, and Memory (CALM). In one study, a large sample of over 400 children were recruited through educational referrals for a range of learning problems. Detailed profiling of the children indicated that dimensions of cognition and behaviour were more important than diagnoses. She also presented evidence on when intensive cognitive training could be most effective. While no panacea, it was most beneficial when children had to learn to do something new, rather than striving to overcome a narrow core problem. Lastly, neuroimaging of the brain structure of the struggling learners pointed to inefficient white matter connectivity as a marker of learning problems. Indeed, measures of brain connectivity could predict maths and reading ability. An enthusiastic audience raised a number of questions in the Discussion session, including the relative neglect of secondary education as a period to remediate deficits not addressed through early intervention, the importance of the child’s self-esteem in response to their slower learning progress, and the role of the teacher in identifying each child’s strengths as a foundation on which to build strategies to overcome their difficulties. Professor Gathercole finished by describing an ambitious future project to collect advice and tips from university students who have overcome learning challenges on the best strategies to pass on to the struggling learners of tomorrow.